I might just be speaking for myself here, but the past few weeks have been very hectic. Between way too many Christmas parties to count, wild New Year's celebrations, and — of course — everything in between, there's been a helluva lot going on. I, personally, am totally and utterly exhausted, and TBH, I have absolutely no motivation to cook. And if you're feeling that, too, you're in luck — it turns out that Cicis is offering a free pizza buffet on Jan. 2 for a stress-free post-holiday treat, but keep in mind that it's only around for one day only. You'll want to get on that ASAP. In my 20-something years on this planet, I've never had the honor of going to Cicis Pizza. But, it looks like today will have to be the day I go. On Wednesday, Jan. 2, the buffet-style pizza chain is offering free Adult Buffets, as long as you purchase another Adult Buffet and a large drink, according to a coupon on the Cicis website. Why? Well, it's National Buffet Day, of course! Thanks to this deal that exists because of another daily "holiday" coming clutch, you can use it on Jan. 2 with dine-in orders only, and honestly, it might be the best news I've heard in 2019 thus far. So, make sure to get on it as soon as you can. Regardless of how far you'll have to go, I can guarantee it will be well worth the hike. If you know me at all, you are probably well aware of the fact that I love a good BOGO deal. I mean, there is seriously no downside. Aside from getting a better bang for your buck, it encourages me to take a friend out to a meal. And whether you decide to treat your childhood BFF, if you choose to bring your cousin, or if you're simply attempting to seduce that guy you've been chatting with on Tinder later today, this is a totally fabulous deal that you should 100 percent consider taking advantage of. There is — hands down — nothing better in this cruel, cruel world than a pizza buffet, unless, of course, it happens to be free. Definitely count me in. Once you have gotten in on Cicis free buffet deal today, you will have the chance to get half-off Pizza Hut pies for the rest of the week. That's right — through Tuesday, Jan. 8, the renowned pizza chain is offering 50 percent off pies, as long as you order online or through the app. It will be available for delivery and carryout orders only, so definitely make sure to get this deal while it's hot — your wallet will thank you later. 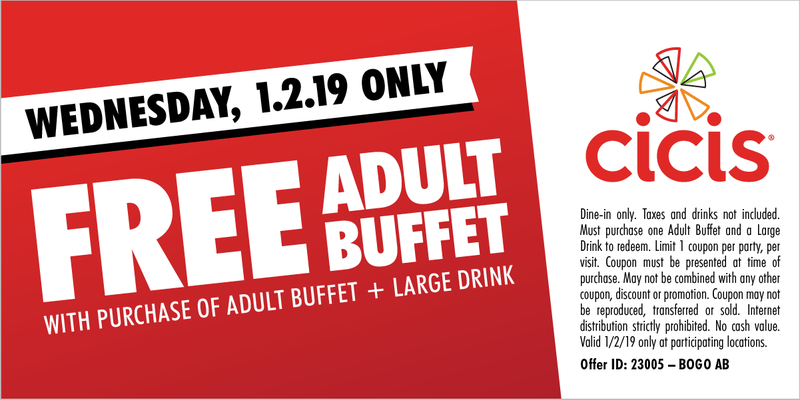 Cicis is starting off 2019 hella strong with BOGO Adult Buffets on Jan. 2. Yes, you heard that correctly, and there's absolutely no way I won't be going there as soon as it opens today. You'd better believe my first experience at Cicis will be an undeniably fabulous one, and I don't know about you, but my body is definitely ready for this glorious experience. Bring. It. On.